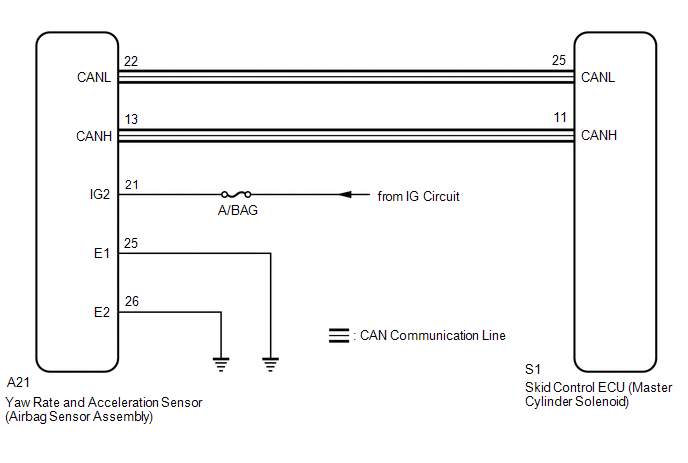 The skid control ECU (master cylinder solenoid) receives signals from the yaw rate and acceleration (airbag sensor assembly) via the CAN communication system. The airbag sensor assembly has a built-in yaw rate and acceleration sensor and detects the vehicle's condition using 2 circuits (GL1, GL2). If there is trouble in the bus lines between the yaw rate and acceleration sensor (airbag sensor assembly) and the CAN communication system, DTCs U0123 (yaw rate sensor communication trouble) and U0124 (acceleration sensor communication trouble) are stored. At vehicle speed of 10 km/h (6 mph) or more, signal from either GL1 or GL2 does not change for 30 seconds or more. Following condition repeats 16 times. GL1 and GL2 do not change by more than 2LSB when vehicle decelerates from 30 km/h (19 mph) to 0 km/h (0 mph). Following condition continues for at least 60 seconds. Difference between values calculated from acceleration sensor value and vehicle speed exceeds 0.35 G.
When U0073, U0100, U0123, U0124 or U0126 are output together with C1232 or C1234, inspect and repair the trouble areas indicated by U0073, U0100, U0123, U0124 or U0126 first. (c) Check if DTCs U0073, U0123, C1210 and/or C1336 are output (See page ). (a) Check that the yaw rate and acceleration sensor (airbag sensor assembly) is installed properly (See page ). The sensor is tightened to the specified torque. 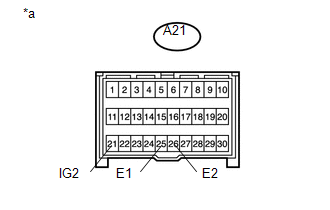 (a) Disconnect the yaw rate and acceleration sensor (airbag sensor assembly) connector.